It was always going to be just a matter of time before someone came up with something as exciting as Etihad Airways’ ‘The Residence’ and ‘First Apartment’. And while Qatar’s entry is a business class one, it’s no less crowd pleasing. 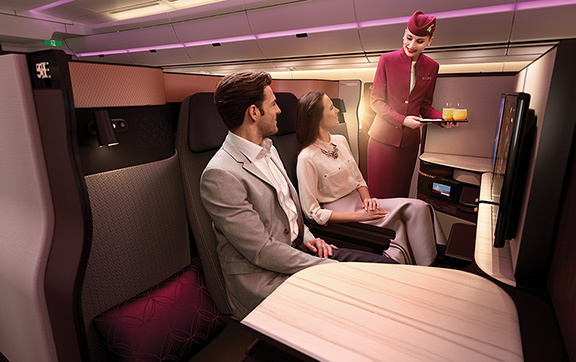 In a dramatic unveiling to an audience of more than 7,000 people, Qatar Airways revealed its long-awaited, highly anticipated new business class offering at the ITB Berlin – the world’s largest tourism trade fair. Up until now, details of the product kept us all guessing and speculating as to what the Gulf carrier would come up with. Innovations like showers has been done, the cool onboard lounge/bar has been done, leading carriers all offer flatbeds these days; so how exciting could Qatar’s new product be? Well, read on friends and discover the latest enhancements in business class that’s got the whole industry in a spin. The crux of the new Qatar business class of course is the new seat concept aptly named the ‘Qsuite’. We say ‘aptly’ because, though it is a business class product, the seat is more like a suite set-up that you would expect to find in first class. The show-stopping feature is the capability of the middle seats to become double beds in an industry-first patented design. The middle seats alternate from forward-facing to rear-facing, which allows a party of four to socialise with each other. However, it is only every second pair of seats that turn into the double beds, with the other seats more noticeably further apart. Adjustable panels, and movable TV monitors enables families to create a ‘living room’ and colleagues a work area. If you are not travelling as a foursome though, or even as a duo, privacy panels (which stow away if you feel sociable) allows you to turn your seat into your own private space. Customisable features ultimately allow you to create your own zone depending on the nature of your journey. On the window seats, high walls that measure at 135cm high and a solid sliding door truly gives the feeling of a first class suite. Each B/E Aerospace built seat is made with a new level of luxury that starts with the hand-stitched Italian leather it’s encased in and the rose-gold accents it’s finished with. The seat itself measures at 21.5 inches wide and has a host of personal space surrounding it with plenty of storage options for personal items. A range of controls allows you to adjust the seat into your preferred position and into the 79-inch fully-flat bed when you’re ready for sleep. The new Qatar business class will deliver enhanced onboard customer service, including a new dining concept that features a fresh menu offering a number of new dining choices. This includes a selection of ‘snack sharing’ dishes to go with the social-enabling scenarios that the new middle seats encourage, and can be enjoyed on elegant new chinaware and cutlery. If you’re not an early riser, the Express Breakfast option ensures you sleep for as long you please which you can enforce by hitting the hotel-style ‘Do Not Disturb’ button. New partnerships with high-end firms means the latest, luxury amenities will be available inflight. This features The White Company – a UK-based linen outfit – providing the new Qatar business class QSuites with luxurious bed linens and cotton sleeper suits. Italian luggage maker, BRIC’S will house bespoke products by Castello Monte Vibiano Vecchio inside the inflight amenity kit. Passengers can also look forward to the new Qatar business class Oryx One’s next-generation user interface. The award-winning entertainment platform has been redesigned to make content surfing even easier, with its choice of 3,000 entertainment options – the most currently offered by any airline. The next-gen user interface features a special children’s menu in a revolutionary, yet easy-to-use format. 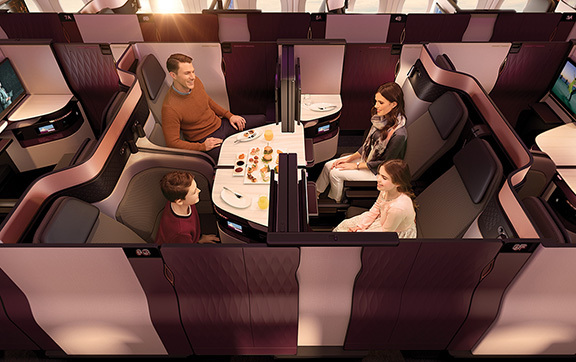 Upgraded inflight connectivity is also on the cards for the SkyTrax awarded ‘World’s Best Business Class 2016’ airline. 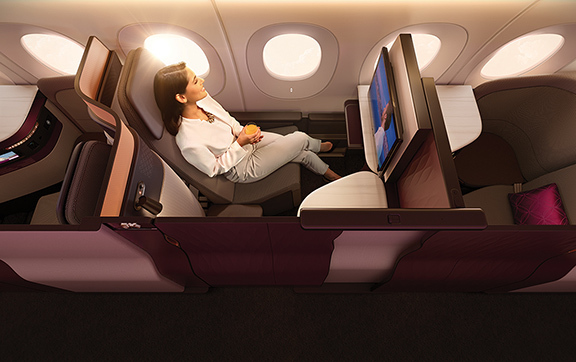 The Qatar business class upgrade coincides with its 20th year of operations and to observe the ground-breaking transformation, the QSuite will be vigorously retrofitted across the airline’s fleet from June this at an impressive rate of about one aircraft per month. 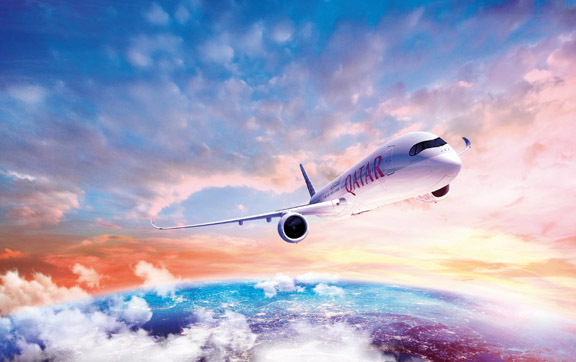 The first jet to operate with the new QSuite will be Qatar’s new Boeing 777-300ER aircraft on the Doha-London route. Later in the year the new Airbus 350-1000 will follow. A slightly modified version of the new Qatar business class QSuites will also be installed on the Airbus A380 and Boeing 787. This is because original version of the QSuite will not fit on the narrower body of the Boeing 787, nor is it completely congruent with the upper deck of an A380 (where Qatar fits its business class). However, privacy will still be the emphasis and the range of improved inflight services will also be available. Just got back from a return trip to Dublin. Service and food were excellent, will go again soon.